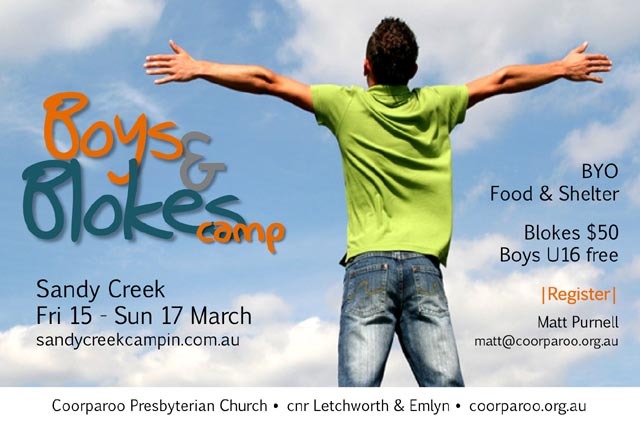 Join the boys & blokes at beautiful Sandy Creek. Good surroundings, good company, good time. March 16th – 17th. See Matt Purnell to register. At the close of the 1st century, John writes to a group of small, weak and confused churches. Faced with persecution, tantalizing false teaching and alluring idolatry, they’re in an epic battle not to compromise. At the beginning of the 21st century, the church in Australia is also small, weak and confused, and she shares the same battle. In the face of overwhelming odds, John encourages them, and Christians in all times, to overcome because of the One who overcame. The battle will be long and hard, but to the one who overcomes in Jesus, the struggle will be so worth it. Beginning Sunday 3rd of March, come along and hear God’s promise to the one who overcomes.